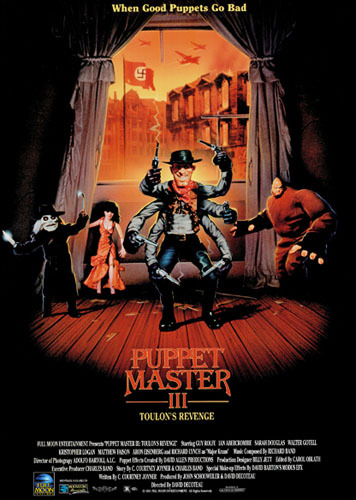 Tweet by tweet reviewer Tim Schilling has been attacking Puppet Master series all week long. While he didn’t mind the first installment, he pretty much hated Puppet Master 2 and now he is back with a review of the third installment of the series. Can this series redeem itself or is it officially over? Last chance I’ll give this series. 0:10 Didn’t the drill head puppet get dissected in the last movie? 0:15 I get the feeling that these movies didn’t even have a script.They’re just shooting whatever they have on set that day. 0:22 Is this a prequel…? Or did they just decide to have nazis in this movie just cause. 0:30 I wonder what’s going on. 0:35 I just really don’t like the puppet that pukes leeches. Too gross. 0:39 Wait, it’s actually been following the same plot for the last half hour. This is groundbreaking for this series. 1:08 I wanna know what kind of gun thy puppet has, it’s like half an inch long but killing everyone. 1:13 This whole movie was just to make that main puppet with the hook? 1:19 At least the ending of these movies are always somewhat entertaining. Well, I don’t have much to say about #PuppetMaster3. I feel the same about it as I did the first two. I was looking forward to watching this series, and it had a ton of potential to be good, but none of the movies even has a story to follow.